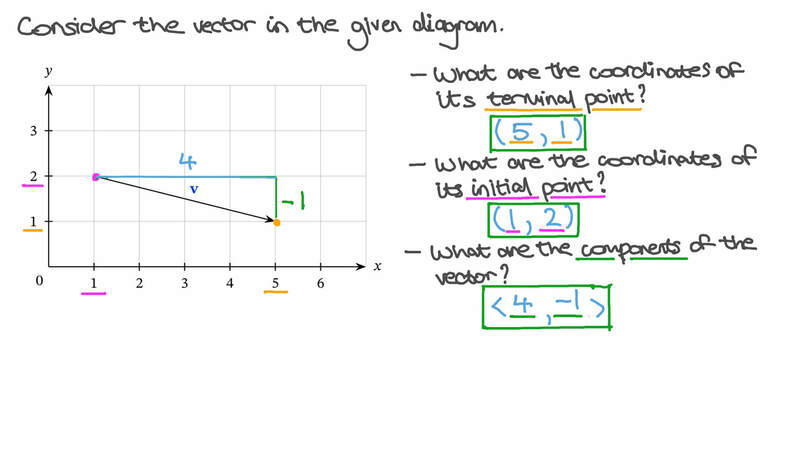 In this lesson, we will learn how to determine the components of vectors from graphs. The components of the vector ⃑ 𝑢 are ( 1 , 2 ) as the terminal point of the vector is 1 unit right of the initial point and 2 units up from the initial point. What are the components of the vector ⃑ 𝑣 ? The components of the vector are as the terminal point of the vector is 1 unit right of the initial point and 2 units up from the initial point. What are the components of the vector ? Find the components of the vector  𝐴 𝐵 . Consider the vector in the given diagram. What are the coordinates of its terminal point? What are the coordinates of its initial point? What are the components of the vector? Is it true that two vectors with the same components are always equivalent? Find the components of the vector . The components of the vector are as the terminal point of the vector is 2 units right of the initial point and unit up (1 unit down) from the initial point. What are the components of the vector ? Find the components of the vector shown on the grid of unit squares below. Using the given figure, express  𝐴 𝐵 in terms of  𝑀 and ⃑ 𝑁 . The components of the vector are as the terminal point of the vector is unit right (1 unit left) of the initial point and units up (2 units down) from the initial point. What are the components of the vector ? The components of the vector are as the terminal point of the vector is 2 units right of the initial point and units up (1 unit down) from the initial point. What are the components of the vector ? 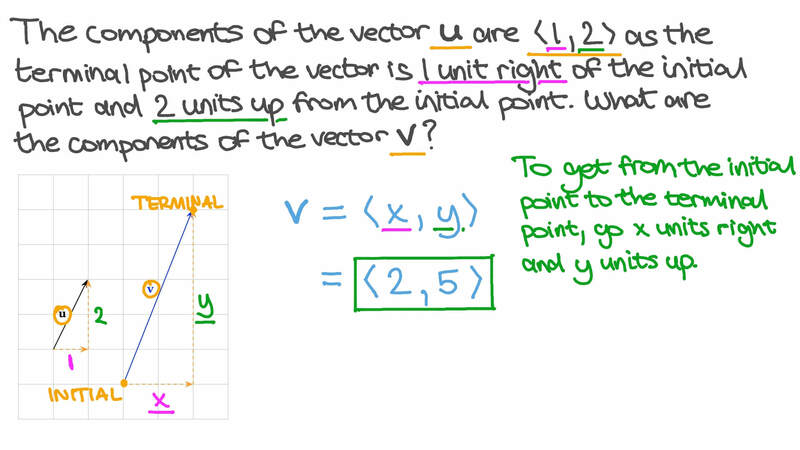 The components of the vector are as the terminal point of the vector is units right (2 units left) of the initial point and 1 unit up from the initial point. What are the components of the vector ? The initial point of the vector shown in the diagram is the origin, . Is it true that two equivalent vectors will always have the same components? Given that 𝑥 ( − 1 , 𝑦 ) = − 2 ⃑ 𝑖 + 2 ⃑ 𝑗 , determine the values of 𝑥 and 𝑦 . Suppose ⃑ 𝐴 = ( 4 , − 3 , 2 ) . What is the component of ⃑ 𝐴 along the 𝑧 -axis? Given that ⃑ 𝐴 = ( 1 , 𝑚 , 𝑛 − 4 ) , ⃑ 𝐵 = ( 𝑠 , − 2 , 4 𝑛 + 5 ) , and ⃑ 𝐴 = ⃑ 𝐵 , determine the values of 𝑠 , 𝑚 , and 𝑛 . Express ⃑ 𝐴 = ( 1 , − 6 , 4 ) in terms of fundamental unit vectors. Given that ⃑ 𝐴 = 1 1 ⃑ 𝑖 + 6 ⃑ 𝑗 + ⃑ 𝑘 , determine the component of ⃑ 𝐴 in the direction of the 𝑧 -axis.